Here are results (in a shorter summary format) for week 2 of my Planetary Interaction results. The difference between this week and last week, as far as moving resources back and forth, was that I purchased various amounts of refined commodities before heading out. My planets don’t produce refined commodities in the same quantities, so I bought more of the least produced items, in order to make an extra advanced commodity or two. Basically, I evened out the quantities by buying an extra amount of the low 2 PI-produced commodities, to equal the amount of the 2nd highest. I couldn’t afford to buy up the low 3 to equal to top amount. For example, looking at last week’s numbers, Chalice would have bought 60 polytextiles and 40 synthetic oil, so that she had 170 of polytextiles, synthetic oil, and fertilizer. There would be leftover superconductors, which eventually could be also sold off. But I didn’t sell the extra this time, in order to track what just producing the advanced commodities earns. Income is a little better, but still dismal at a little over 5 million ISK per week. I was hoping for an income more like 10 to 15 million ISK per week, doing PI once a week, but maybe that’s too much to hope for. Unfortunately, I fall short by over 50%. I’m sure it is the combo of “high-sec” and “once a week” (for 2.5 hours), but that’s all the time I’m willing to spend basically farming ISK to support doing fun stuff. I’m following with great interest, Mabrick’s challenge, taken up by Grimmash. I can’t replicate Mabrick’s numbers, heck I can’t even get 10% of those numbers (although I am not making NRP; maybe the markup on that is enormous). Even the modified profits from Kao Jai are nearly orders of magnitude larger than my results. Is that really high-sec and 30 minutes a day?! If that were true, wouldn’t everybody be PLEXing their accounts effortlessly from hi-sec profits? I can’t believe CCP wouldn’t nerf that. It could be shifting to NRP is the way to go, but that would require rebuilding most of my PI infrastructure, selecting new planets, and grinding more ISK to build it again. I’m just not up for that. I have a good overall feeling from these past weeks of commodity production, and with the time I spend on the planets I have access to, there is no way I’d make 100 million ISK in a month – I’d be a high risk loan from Mabrick’s corporation’s point of view; a “non conforming loan” in mortgage parlance. So I’m not going to go that route. However, I have figured out what I’ll do going forward, and I’ll get to that later. Here is how week 1 of Planetary Interaction went, using a 6 day 22 hour extraction cycle. Now that I’m done building out the infrastructure, I can collect profit. Note that the Advanced Commodities produced were actually using last week’s materials, so this first week might be a little off, but that should even out. Also, I’m rounding ISK amounts to the thousands. Furthermore, I’m accounting for export/import taxes by just recording ISK after I’m done at the market. I’m too lazy to split out the various fees involved. My first/main character is running colonies on 5 planets and producing Nano-Factories. That involves 4 Refined Commodities and the finished product. I exported and hauled the 4 Refined Commodities to the first planet, dropped them off, picked up the Nano-Factories, and hauled to Dodixie to sell. While traveling to Dodixie, I reset a 6 day 22 hour production cycle. An alt is producing Organic Mortar Applicators using 5 planets. Did the same pick-up, drop-off, and hauling to market to sell. An alt is producing Sterile Conduits using 5 planets. Unfortunately, the profit numbers are completely dismal. Another surprising thing was the time it took; the bulk of which was travel to/from Dodixie. So, I did the typical thing when faced with travel, killing time by doing household chores and/or watching TV (thank goodness for TV via Netflix DVDs and the ability to pause at will) or reading on another computer. At this rate, it would take 23.2 weeks to accumulate 50 million ISK to buy a NRP blueprint, or 4.6 weeks to accumulate 10 million ISK for a Vexor cruiser (and of course, I’d really want several times more to account for loss). That’s terrible – these expenses are just roundoff for established players, but large obstacles for me. I made far more than ~2 million ISK/week while building out my planetary interaction infrastructure. I suspect the difference is the 7 day draw cycle versus the 1/2 day cycles I used previously. I’ll see what next week’s numbers are, but it looks like a weekly PI cycle won’t be enough income to be useful. Another possibility is that manufacturing Advanced Commodities isn’t worth it, due to the export/import taxes moving Refined Commodities to the factory planet, and the export taxes on the resulting Advanced Commodities. Production is throttled by the least-produced commodity. I could try boosting production (e.g by upgrading command centers, supplying more power for more extractor head units), or buying extra commodities to make up for the deficient ones. Both strategies require more ISK which in turn would require more time-intensive PI fiddling, but that’s just not going to happen. I might try a week of just selling the Refined/Specialized Commodities, instead of processing them all the way to Advanced. I hope that works out better, because if it takes several weeks to earn the amount for an inexpensive decent ship, I have some thinking to do about playing. 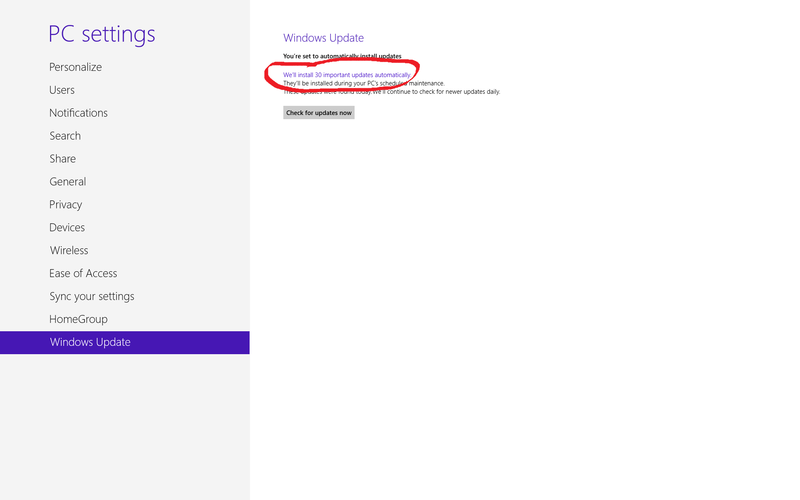 It was not a good past few days for my Windows 8 notebook, because the recent patch Tuesday really broke something. After trying to fix things Tuesday evening, I gave up and reinstalled (used the “Remove everything” option new in Windows 8) and as of late Thursday, got things back to working conditions. My computer crashed during the shutdown after patching, so it then booted into recovery mode, which didn’t do anything to stop a crash on the next reboot. And as a side effect, my networking stack was also nonfunctional. The Windows 8 crash screen is friendlier looking – it displays a smiley with a nice quote along the lines “We apologize, there was a terrible error and it all blew up.” No more bugcheck a.k.a. blue screen of death, which was not useful to most people, unless you happen to have a kernel debugger attached. Good thing I also had my Mac Mini so I wasn’t completely dead in the water! I could still play LoTRO and EVE, and Google search for information, while my Windows notebook was useless. Anyway, I happen to be set up for some debugging my home notebook (a habit from my day job) so looked at the minidump file and noted the problem was indeed during the shutdown code path. Ironically, a “graceful shutdown” call was in the stack trace. Maybe not-so-graceful after all. I don’t have anything installed on this notebook except Google Chrome, Steam (and various games managed through Steam), and current nVidia video drivers. So, after fiddling for an hour or two and getting nowhere, I gave up on fixing things and went to repair via the new Windows 8 option, found in PC Settings->General->Refresh. Unfortunately that didn’t work – the process also crashed during shutdown, so I had to try the heavier “wipe files, except for Windows 8 apps, and reinstall”, found in PC Settings->General->Remove. I had no Windows 8 apps installed so I just did it. Both Refresh and Remove merely required me to insert the Windows 8 DVD and do something else for a while. But if that didn’t work and I was forced to reinstall from scratch (guimode setup and format my disk, etc.) then I would have gone back to Windows 7, since it would have been the same amount of work and I had ~3 years of generally problem-free use on Windows 7. Just the occasional bugcheck coming out of hibernation. The Remove option did work, and my Windows 8 notebook booted up with no errors and a functioning network stack. Now all I had to do is apply patches… 30 of them. *GULP*. That’s what made my system bomb last time around. That also didn’t take too long, and before going to sleep I installed Steam and queued up the games I had installed. That went all night and the next day after work I still had a few more to grab. A friend talked me in to trying out DayZ, a mod that turns those Arma games into a zombie survival game. Normally I wouldn’t have a FPS installed since I’m not a fan of the genre. So by Thursday night I had reinstalled those games, and then had to run/patch LoTRO, The Secret World, Fallen Earth, and EVE Online. There were various .NET Frameworks to download and reinstall, Visual C++ redistributables to download and install, DirectX to… you get the idea. On top of that, each game needed to download some amount of patches to update itself to the latest version. Thank goodness a Steam reinstall isn’t that painful. It took a long time but at least I didn’t have to hunt down dozens of DVDs and babysit all those reinstalls. I haven’t written much about EVE lately, because I haven’t been doing anything other than setting up colonies/factories on planets. I’m finally closing in on having 3 characters producing Advanced Commodities (Nano-Factory, Organic Mortar Applicators, Sterile Conduits). It has been a slow process, because I bootstrapped all of it from ~8 million ISK. 2 million of that went into buying the skillbooks for my first character, and 4 million went into developing the first colony. From there, I reinvested the profits into more colonies, skillbooks, and PI expansion for my 2 alts. Soon, around 6 weeks after I started, I can just accumulate the profits for a while. Others also recommend Planetary Interaction – Mabrick has a nice write up. The catch with his setup is that you need more seed money to start, around 80 million ISK (!!). I had 10% of that, earned from the newbie missions plus the intro storyline arc, The Blood-stained Stars. EVE is like the real world – if you have a nice chunk of money, you’ll have an easier time making more. Mabrick does offer a solution for this – a generous loan program. Check it out! Mabrick suggests making Nanite Repair Paste. I looked into doing that, but there were two obstacles I couldn’t overcome: 1) 50 million ISK for the blueprint, and 2) needs 6 planets (level 5 Interplanetary Consolidation – about 3 weeks to train after level 4). Maybe I’ll come back to NRP after building up the ISK and taking the extra training hit, and of course crunching the numbers to see how profitable my setup is. Sugar Kyle also writes about finances and newbie players, with some advice and the observation that “trickle income” might be enough. As a newbie player myself, income or lack thereof, is something I’m keenly aware of. For all that various players talk about risk and fun outside of high-sec, the reality is that a player needs an ISK cushion large enough to absorb some losses. Whatever a player might want to do in game, they need a steady/reliable income source to fund it. As a newbie, this is difficult because you have almost nothing to fall back on, so the risk you can shoulder is minimal. There are profitable things to do, but I find two of them very boring (mining, trading). I wouldn’t recommend what I’m doing – I can’t imagine spending 6 weeks to setup PI would have widespread appeal. To be totally honest, I recommend that newbies just buy a PLEX and sell it for the 500 million ISK or whatever current rates are. Doing this crossed my mind a lot, but I’m stubborn. Someone that does go the PLEX route can take that pile of ISK and have some fun in game; the only requirement is for them to figure out an income stream before burning through it all. They could do fun stuff in the meantime. They’d get to see if they enjoy what they want to do versus flailing around trying to make ISK as their overriding concern. They might end up with nothing, but that can happen anyway. In that event, they are out the cost of 1 PLEX and can decide if continuing their subscription is worth it to them. May as well find out sooner rather than later. I’ve shifted around my PI schedule a few times. I started with a 4 day/3 day cycle, so that I was fiddling with PI on the same two days a week. Then I tried a 23 hour cycle, but it was too much time for me. Then I tried a 2 day cycle. Now I’m migrating to a 7 day cycle (technically a 6 day 22 hour cycle), and this weekend will be a turning point – I’ve finally built out PI across 3 characters, and can accumulate profit rather than reinvest into expansion. A ~7 day cycle won’t result in maximum production, but it fits my desired schedule better. I’ll track profits and report here. Basically, I’m trying to avoid Jester’s Strangled in the Crib scenario, where I drift away from a combination of 2 things: lack of ISK, and lack of enjoyment earning the ISK. It has been far too long since I played in Middle Earth, so I cranked up the Mac LoTRO client 😉 and ventured in to continue my adventures. I had left off in Harwick, ready to take the Warsteed tutorial. After speaking to Seoca, I summoned my new Medium Warsteed, named Keely. Once I got the hang of it, I advanced in the tutorial to the combat portion. My task was to land 10 blows on a training dummy, so I started, building up speed/fury for a single hit and then stopping. Eventually I got the hang of “steering” my warsteed around the oval at speed – granted, I wound up taking some turns VERY wide; good thing there were no spectators lining the course! – and rotated through my mounted attacks on the training dummies. I finished the tutorial and collected the Legendary Bridle reward. I’ve found a few here and there in Rohan, and now have the trait the lets me slot them and advance their traits. 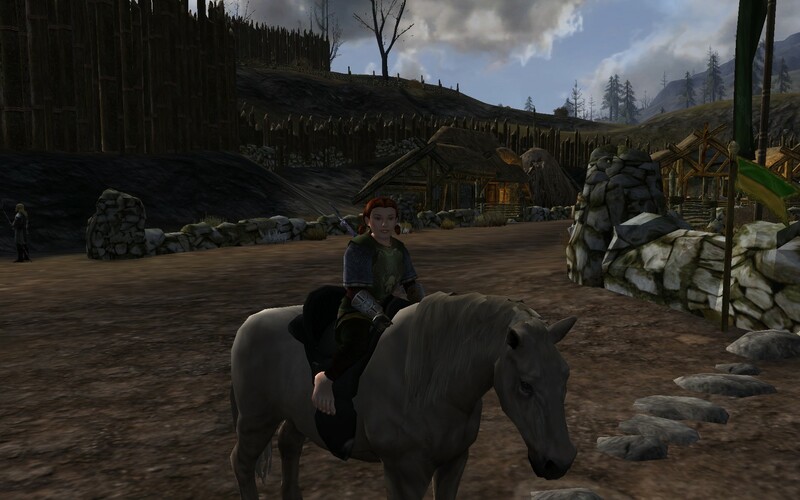 I need more practice controlling my Warsteed, so instead of riding my regular mount around, I’ll use Keely as well. I’m behind the entire rest of the player population as far as Warsteed knowledge, but the good news is I can read up on various excellent guides others have published. 🙂 For example, Danania: Supergirl of Lórien, has a 5 part guide I am going to study, starting with part 1. My main computer has been a mid-2009 Mac Book Pro. It’s fine for most everything I do, except for a few games. Plants vs. Zombies is fine. Even Civilization 5 is tolerable. MMOs, not so much. It stutters playing the intro EVE video. 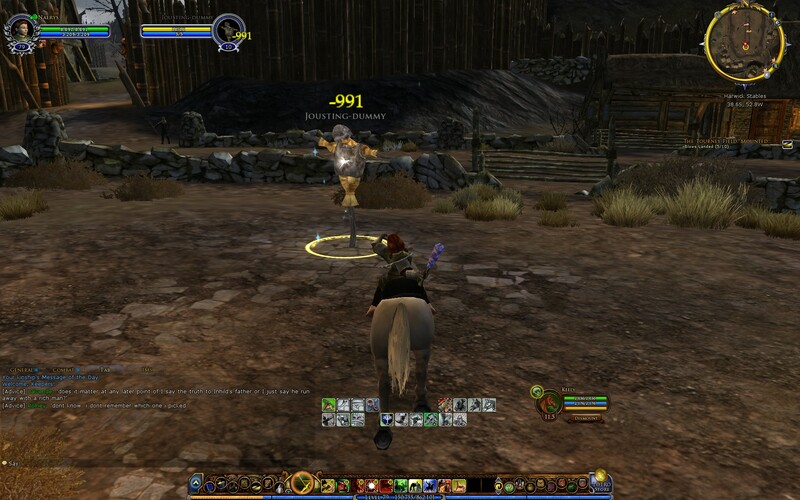 It is far below the recommended minimum for LoTRO and GW2. For those games, and other Windows-only ones, I have another computer, an early-2010 Sager notebook, recently upgraded with an SSD and Windows 8. The Sager works well enough for me, except for graphics issues which I think might be related to overheating (which seems to manifest during GW2 quite a bit). Anyway, I decided to treat myself to a computer upgrade, since my trusty MBP was approaching 4 years old. I bought a Mac Mini, upgraded with a fusion drive and to a core i7. And I added my own 16 GB since Apple charges way too much for memory. As a result, I am now playing a few games on the Mac Mini instead of the Windows box. EVE Online is one, LoTRO another, GW2 yet another. I downloaded the League of Legends OSX, but have yet to make an account or play. I tried installing the DDO OSX client, but I can’t seem to get a non-corrupted copy. I also play other games on my Mac from time to time: FTL and Hoard – both of which run better on the Mac than Windows, but I suspect the Windows 8 issue is with mouse drivers. The Mac Mini also runs Space Chem just fine, as well as Borderlands 2, Torchlight and various other misc games. Yes, I hear you Windows purists gnashing your teeth. The Intel HD4000 integrated graphics vs. a dedicated nVidia GeForce or AMD Radeon? Outrageous! Barbaric!! However, I think the games look just fine on the Mac Mini, especially since one of them (GW2) was nearly unplayable on my Windows notebook due to graphics driver resets (possible driver issue, possible overheating; ultimately I got tired of dealing with it). Some games, like bleeding edge first person shooters, undoubtedly won’t play as well too, but I play very few games of that genre. I do notice some upgraded graphics. In EVE, I see lightning flashes on storm planets, gas clouds on gas planets, weather effect on temperate planets, etc. I never saw those on the Windows notebook, but it is a 3 year old machine with a GeForce GTX 285M, so perhaps it is also on the low side for modern games. Of course, all is not perfect. For example, EVE Online… right now, the launcher doesn’t start the game. I click “play” and it just exits. *sigh*. I’ve tried various troubleshooting steps, but nothing has worked. I’m sure it will be sorted soon.